Alaska --- which cruise and itinerary is the best?? My husband and I want to take an Alaskan cruise for his 50th. There are so many lines and itineraries out there --- which is the best?? We always book interior rooms because of the price and we aren't in the room very much. But with Alaska... we will splurge and get a balcony at least. Can anyone give us some pointers on what line is the best and what itinerary. Hi, welcome to Alaska------You didn't mention how much time you have for the trip. That is very important as there are a number of basic itineraries to ponder. I always encourage first timers to try for two weeks. I also suggest crossing the Gulf of Alaska and doing some of the interior. There are three basic types of Alaska cruises: 1. The round robin, from either Vancouver BC or Seattle, this type does not cross the Gulf or go to Central Alaska, they only do Alaska's Southeast "Panhandle" and usually go as far north as Skagway then head back south, during which many of the obligatory ports in Alaska's inside passage are visited. About 65% of all Alaskan cruises are of this type and almost all are of a week duration. 2. Cruises which begin or terminate in Seattle or Vancouver or begin or terminate in Anchorage (Note, very few cruise actually visit the Anchorage port, rather they use the more southern ports at Whittier or Seward, if the cruise begins in central Alaska guests fly into Anchorage and if they begin in Seattle or Vancouver they fly home from Anchorage (Note: some guests don't fly back home but return on the ship, which involves a "back to back" booking). 3. Many visitors prefer to cruise to Alaska or cruise from Alaska and spend a week or more on land touring the interior and central Alaska (You won't see the big mountain very well "Denai" or Denali National Park unless you go inland and get away from the coast). They usually do this by renting a car and going it alone or taking one of the popular "cruise tours" offered by a few of the cruise lines serving Alaska. There are other variations but these three are the basic, give me the time you can spend and I will try to narrow it down. The most noted major lines serving Alaska are Princess, HAL, RCCL, Celebrity and now Disney, some of the other majors schedule a few cruises up here from time to time. Also, luxury lines like Regent, Silver Seas, Crystal Cruises and Seabourn are seen quite often as well. By far and away Princess and HAL are the big boys since they made major investments (They own numerous hotels and resorts, tour companies, railroad dome coach cars, coaches, etc here), in Alaska decades ago. As a result both lines get seniority preferences for sailing into Glacier Bay in the National Park there, this is because cruise ships entering the bay are restricted to annual allotments due environmental concerns. 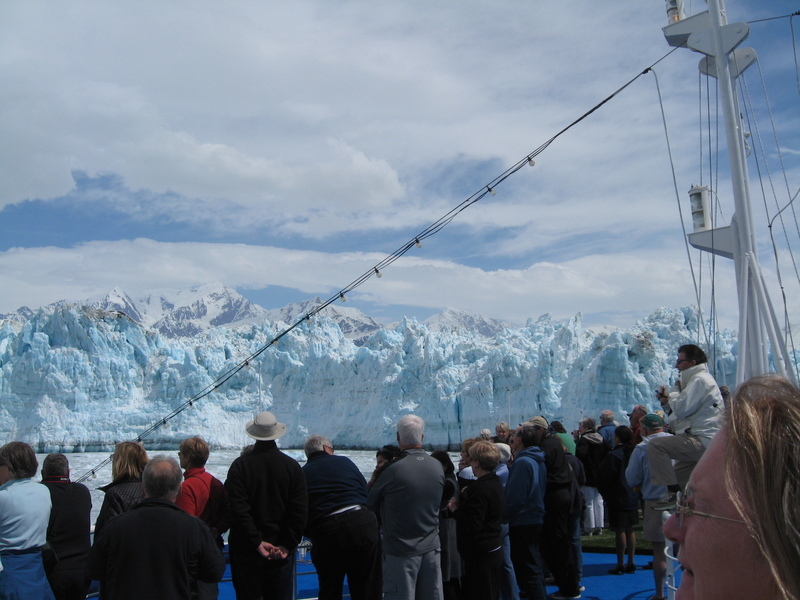 The three major glacier viewing, from cruise ships, attractions are Glacier Bay, Tracy Arm and Hubbard Glacier. It is debatable which is the best, I prefer Hubbard Glacier, for glacier calving viewing, but the ship must leave the inside passage and travel about half way north across the Gulf of Alaska to see it. Glacier Bay is definitely preferable to Tracy Arm, unfortunately, since entrance into the Bay is so limited many lines can not get a permit to go there. Thanks for the info... I will look into it. But as far as how much time we have, we are only allowed to take 6-7 days off of work so if it's longer than that... It will have to go into the weekend. 1. Will it be just you and husband or are kids going with you ? Age of kids ? 2. When you fly into or out of Anchorage the bus ride is about 4 hours to the port, makes for a very long day. I left Los Angeles at 8:30 am and did not get to the ship until about 9 PM with the flight, bus and check in. 3. Do you guys enjoy the party ships or are you more into relaxed and high experience? We will only be able to be gone for a week or little over if it goes thru the weekend. We have always sailed Carnival and enjoy them so we like the "fun ships" but not necessarily party ships as we usually are in bed no later than midnight. One thing you don't want to do is cram too much into too little time. Use the limited time you got to relax and enjoy. Since you are looking at a week cruise I would suggest Seattle and do only Southeast Alaska (Inside Passage). If you enjoy Alaska then next time attempt to get more time off in the summer and do a "Cruise Tour" for two weeks, terminating or originating in Central Alaska at either Whittier or Seward (ports for Anchorage). The tour portion will allow you to have a good look at interior Alaska. I'm assuming you will be originating from your home in Minnesota so there out to be ample connects. Try this one http://www.princess.com/find/cruiseDetails.do?voyageCode=3628. As I previously mentioned, Princess and HAL are the big players up here due to decades of investing and experience here, Princess being twice as large as HAL. We enjoy Princess but have cruised only on HAL, Princess and Regent. We have lived up here all our lives, originating in Cordova on Prince William Sound. But we did a two week Alaska cruise a few years ago and loved it. Flew down to San Fran, cruised up to Valdez then back down to Vancouver. Hit all the obligatory ports up and down and visited Hubbard Glacier on an absolutely beautiful day. I'll try and attach a picture of us at the glacier then. We have sailed Alaska on Holland, Princess and NCL and have enjoyed them all. With only six or seven days I would look at the round trips out of Seattle or Vancouver. 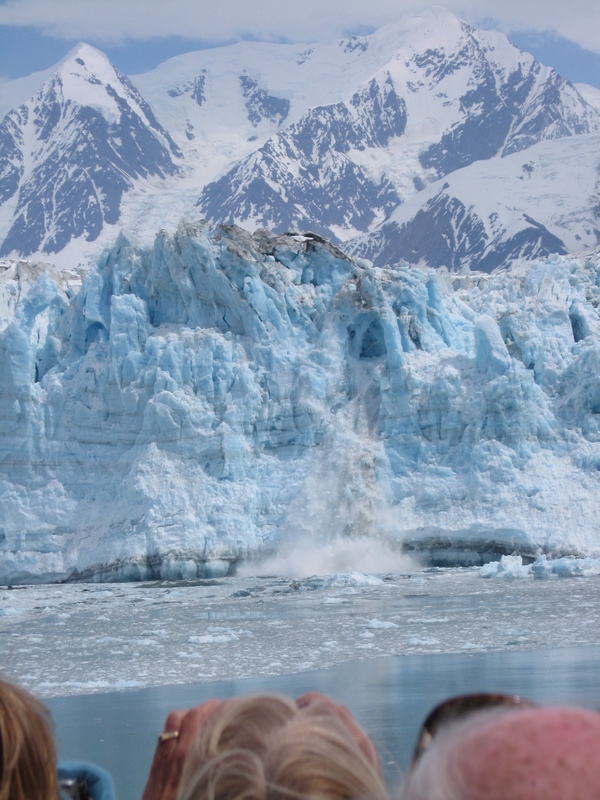 My advise for first timers is an itenary with Glacier Bay. Just my two cents. Since you have liked Carnival I would say stay with what you like. If Carnival is not at a time that's good for you I would suggest RCI Explorer of the Sea's round trip out of Seattle. I have been on one of her sister ships to do a 2 week transatlantic and it is a great ship. You will like the "Royal Promenade" with the pub shops and entertainment, the ship also had a great night club ,rock wall, mini golf pools, hot tub and spa. Great ship but not the best itinerary. Radiance of the Seas goes round trip from Vancouver, it is an older smaller ship that does not have all the stuff that Explorer does, I'd rather go on Explorer. If you would want to go a bit higher end Celebrity Infinity has a good itinerary round trip from Vancouver. I happen to like Celebrity, it is higher end, great food, great service but not as much of a fun ship as Carnival or RCI. Think more lecture series then hairy chest contest. The Infinity is a great ship, a bit older but a good size for getting closer in Glacier Bay then some of the jumbo ships can get. The Celebrity Solstice is another great class of ship and descent Itinerary. I have been on one of her sister ships for a transatlantic and a Greek Islands cruise (this is my favorite class of ship) great food and service. You have to balance your itinerary and fun on ship to pick the best fit. It is a tough call, I hope I have been of help. Alaska is a beautiful cruise I did it about 20 years ago and I want to go back. You can cruise the inside passage in that amount of time. I've been wanting to do an Alaska cruise myself. My boyfriend is partial to RCI (Only 2 cruises hes been on and he enjoys the XL sized ships). They were doing some flyers promoting Alaska cruises, but they were 7 day cruises. I know for sure I would do a balcony. My past 2 cruises were balcony, and were very enjoyable. The BF liked the sound of the water. I know time of the year is very dependent as well. I'm still doing research myself, so any info is always appreciated.